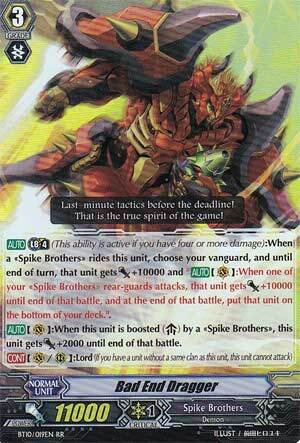 [AUTO] Limit Break 4 (This ability is active if you have four or more damage):When a «Spike Brothers» rides this unit, choose your vanguard, and until end of turn, that unit gets [Power]+10000 and "[AUTO](VC):When one of your «Spike Brothers» rear-guards attacks, that unit gets [Power]+10000 until end of that battle, and at the end of that battle, put that unit on the bottom of your deck.". [AUTO](VC):When this unit is boosted by a «Spike Brothers», this unit gets [Power]+2000 until end of that battle. 4.) Attack and use Dudley Emperor's Limit Break to fill the Soul and call back the 2 Juggernauts (Boosted with Wonder Boy, this is 31,000). 5.) Attack and boost the 2 Juggernauts for the other 2 attacks (Each 26,000-34,000 depending on booster NOT including Trigger Checks). Do I prove my point? The major downside with Bad End Dragger, however, is that he leaves your front line completely vulnerable at the end of the turn, so when you Break Ride, you better try to go for game unless you will be stuck trying to recover from the Break Ride.